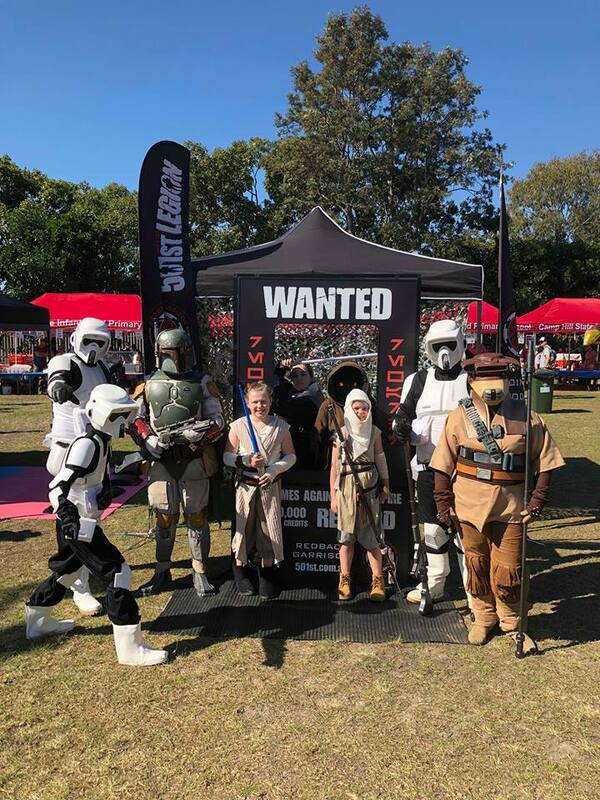 Having been impressed the last time troopers visited the school, the call had gone out for the Empire to once again pay a visit. Redpaint and Kattak were the first to arrive to try and find a suitable base of operations. Leaving KattaK to confirm the position of the base camp, redpaint was shortly joined by Teiwaz and Dark Dora, and then a lone Jedi as they set up their forward operating base. With the arrival of Dreadnought and our 2 wranglers we were all set up and then just having to wait for clearance to enter the base camp. We were all ready to go well before the deployment time of 1pm. Moving to the forward operating base the first thing noticed was the heat on this Winters day. After a little bit of a slow start, we soon saw people coming over for photos and donations. With CTB 1273 retiring early to go on stage for some choir singing, it was decided to give the cadet some support. After this a quick drink break was had, then it was back out for another round of fun, before the sugar started to kick in around 4pm, and it was decided to retreat to prevent any problems. A quick breakdown of the Forward operating base and a clean out of the base camp, and then most troopers departed. Injuries / Malfunctions: The jedi had problems seeing the fence, though no damage done. Mission Status:Complete success of course. Great troop. Thanks redpaint and kattak!! Any time you need support - I’ll be there!! Great report Joe. Always happy to support Megan and Liam's school. It was a top troop. Nice to meet new people too. Looks like a fun day. Well done team. Just for the record. I was making sure the bucket heads didn't trip on the hose that was laid across the gateway.